If you’re a woman and you bleed, congratulations! You drew the short stick! Honestly though, women already have plenty to deal with in life… We don’t need to add toxins, waste, and extra expenses on top of shark week. That’s why I decided to pursue a zero waste period! Read on to find out the benefits of a zero waste period, and the best alternative period products to reduce your monthly waste. Why a zero waste period? There are a ton of good reasons to make your cycle sustainable! Here are some of my tops picks for why you should toss out (or give away?) your single-use feminine hygiene items. Obviously, the first reason is to reduce your waste. Did you know that women will have, on average, 450 periods in their lifetime? If you’re throwing away single-use items each month, that adds up to… A lot. In 2015, The Ocean Conservancy collected 27,938 used tampons and applicators on beaches all over the globe. Yuck! Our periods aren’t going away any time soon, so isn’t it time for us to rethink how we deal with them, maybe a way without so much waste? Other than reducing waste and being more sustainable for the earth, it’s worth it to reduce the waste in your monthly cycle because you’ll also be reducing your toxin exposure. There aren’t any ingredients listed, so this information isn’t readily available, but regular tampons and pads are usually bleached. They can also include aluminum, alcohols, hydrocarbons, and harmful carcinogenic fragrances. And if you think about where you’re putting those products… It’s definitely not anywhere you want to be exposed to toxins! Your woman parts are tough, yeah, but they also absorb whatever nasties you’re putting near them. I know there are organic tampons and pads, but they’re still wasteful single-use items, unfortunately. They will take a long time to biodegrade, and they usually aren’t recyclable. Do your lady parts and the earth a favor and choose something both toxin-free and zero waste for your period. Another reason to ditch the disposables- some awesome health benefits for that time of the month! Reducing toxins anywhere in life is good for a variety of reasons, but it’s especially beneficial to women’s health if you don’t use toxins during your cycle. Cutting back on toxins can help balance your hormones, which can help with weight loss, libido, sleep, and minimize your cramps! Of course, diet can play a big part in your monthly cramps, and you might want to try cutting out sugar or gluten to see if that improves your symptoms. But if you’re just looking for a simple way to have a more manageable and less painful period, try using the products I’ve listed below! Reusable pads and toxin-free menstrual cups also let your lady parts breath, toxin-free, which can help you avoid getting a UTI. Chances of a shorter period with fewer cramps? I’ll take it! By the way, if you regularly have painful menstrual cramps, taking herbal supplements can also help relieve pain. My favorite cramp relief is Earthley’s Ease the Ache extract- it’s a gentle herbal blend that helps cramps go away while easing your mood. Don’t go into your cycle without it! You can buy Ease the Ache here. Remember when everyone was freaking out about the so-called “tampon tax”? (source) Tampons aren’t really a luxury, but they are a regular expense for women. Lucky you! Even though alternative period products might cost more up front, they’ll save you money in the long run. A menstrual cup lasts for up to 10 years, and reusable pads will keep you from buying hundreds of disposable pads! Most women spend about $7 on feminine hygiene products monthly, and you’ll make up that cost and start saving in no time if you ditch the disposables! You can think of alternative period products like an investment- for your health, your wallet, and the planet! They’re worth it. Ok, so I need to clarify this point a bit. I don’t think anyone should be embarrassed that they have a period. Being a woman is not shameful. Our bodies are capable of amazing things! Back when I was buying single-use period products, I would proudly march up to a male cashier just to see what he’d do with my box of tampons. And I didn’t care if people heard something crinkle in the bathroom. Seriously, it’s not that big of a deal! 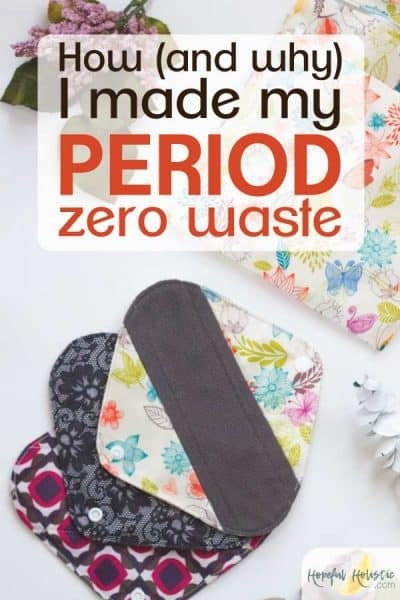 But what I like about a zero waste period is that now, instead of hiding things in my purse or stuffing drawers in the bathroom full of pads and tampons, I can educate people about my period products! It’s nice not to sound like you’re opening bags of chips in the bathroom stall. Instead, you can show off your menstrual cup and the cute patterns on your reusable pads! Starting to use alternative period products has helped me grow as a person. Instead of feeling ashamed about something that’s completely natural, I’ve become more confident and proud of being a woman. That’s something to celebrate! So now that I’ve convinced you, (I’ve convinced you, right?) here are a couple simple changes I recommend for making your period zero waste! They might be a tad more expensive to buy at first, but they pay for themselves over and over again since you aren’t just throwing them out! Each of these period products is better for your health and the earth. My #1 pick for top zero waste period product is a menstrual cup. I use the Diva Cup. They’re made of high-quality silicone, and work kind of like tampons- you tuck them up into your lady parts and they catch your flow. You can get your own menstrual cup here. There are two sizes- model one is for pre-childbirth, and model two is for women over 30, or women who have had a vaginal or C-section birth. Menstrual cups hold way more than tampons (lasting up to 12 hours between changing), don’t smell, are inexpensive, easy to clean, and one cup will last you up to 10 years! Menstrual cups are one of the best ways to reduce waste during your period. There’s a tiny bit of a learning curve when you first start using one, but once you start, you’ll never want to use tampons again! I started using a menstrual cup after having a terrible time backpacking with tampons. It’s been pretty dang lifechanging! I have a pretty heavy flow and it’s nice not to have to change out a super tampon every couple of hours. I always bring my menstrual cup with me when I travel, since periods have a way of surprising you. I’ve been using my cup for over four years now. I call it my goblet, and I’m not planning on getting a new one any time soon! If you don’t like using tampons or menstrual cups, or you just want more security in case of leaking, natural menstrual pads are a fantastic zero waste option. Reusable pads work just like disposable pads, except that they’re non-toxic, odor-neutralizing, and you rinse them out and toss them in the wash before using them again. I thought the rinsing out part would be gross, but it’s not bad at all- the water is just pinkish red. As women who deal with blood regularly, it’s really not a big deal. 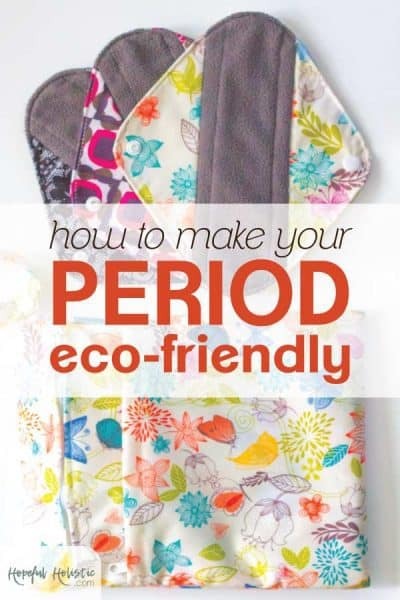 And if you’re looking for a zero waste DIY, why not try sewing your own reusable period pads? Another option for a zero waste period is period underwear. This just means undies that include absorbent parts to help contain your flow. They’re a little more expensive than reusable period pads, but they’re sleek, stylish, and help you forget that you’re even on your period! Thinx is a popular brand of period underwear, and although I haven’t tried them yet, they’re always given fantastic reviews! As of this writing, unfortunately, they weren’t available through Amazon, but I’ll make sure to update this post when that changes! This one’s for the extra-crunchy women out there. You can buy biodegradable sea sponge tampons– little ovals of natural mediterranean sea sponge with a cotton string attached. You just squeeze the sponge to insert it, and then use them like a normal tampon. Afterwards, just rinse, let dry, and reuse! They last for more than 6 months, are sustainably produced, and include no toxins or chemicals. I can’t really talk about a zero waste cycle without talking about toilet paper… Usually, women use more toilet paper during their period, and toilet paper usually comes wrapped in plastic and isn’t made from recycled materials. It’s easy to change your cup or wash out your reusable pads in the shower, and rinse yourself off too, but for times when you have to use the toilet, it’s best to choose an unbleached, recycled toilet paper wrapped in paper instead of plastic. There are good options for 100% recycled, eco-friendly toilet paper made from bamboo and completely plastic free! If you’re looking for a cheaper option, you can get unbleached, 100% recycled toilet paper that comes wrapped in plastic, but is still a way better option than conventional toilet paper! If you want a completely different option to help you reduce waste and save money in this department, check out this post on why you switch to family cloth and how to start. I hope you’ve learned that a zero waste period is good for you, your health, and the earth! Pursuing a zero waste cycle with alternative period products can help you save money, have a nicer period, and reduce your trash. If you’re looking for an easy way to keep track of your progress in reducing waste and living more sustainably, make sure you download my zero waste checklist! The best butter pecan ice cream!